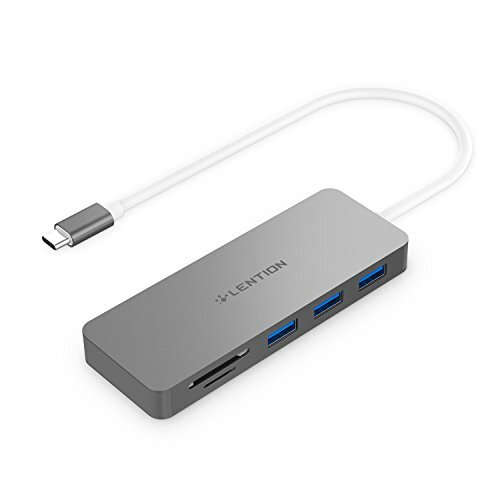 Lention’s C15 USB-C hub falls into the “basic” category, offering just three USB-A Type 3.0 ports, an SD card reader, and a microSD/TF reader—and that’s it. Note that the USB-A ports are spaced far enough apart to support standard-sized USB keys and cords, but without much wiggle room. Why should you buy the C15? At just under $21, it’s dirt cheap, and tucks easily into your bag. It’s worth noting that customers who have previously purchased the Lention C15 complained that the hub became unreasonably hot and in some instances apparently interfered with their Wi-Fi connection. We noticed no such issues, and the hub warmed up to just 84 degrees under load, barely above ambient temperatures. The C15 features an extra-long USB-C charging cable that stretches a full foot, substantially more than the few inches other USB-C hub makers allocate. If you’re concerned at the prospect of a dangling hub, the C15 is for you! Just remember to flip the microSD card upsde down before inserting it—it’s an odd quirk that some USB-C hubs suffer from, including this one. 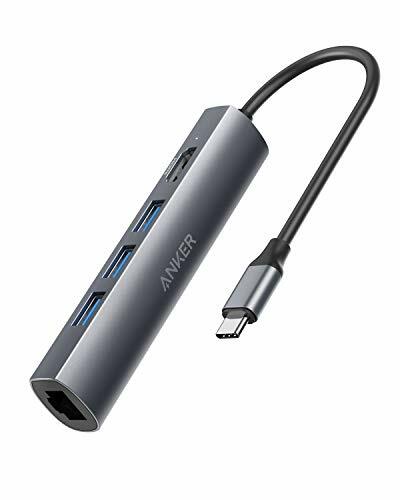 About the length and shape of a cigar, Anker’s AB331 USB-C hub is for those whose notebook or tablet contains a USB-C port as well as an microSD/SD card slot, such as the Microsoft Surface Go. Yes, there are three USB 3.0 Type A ports, Gigabit ethernet, and an HDMI connector—but that’s it. You also get Anker’s good reputation for supporting its products. The hub looks nice, and there’s even a cloth carrying case for its slim 4-inch by 0.75-inch form. But the USB ports are jammed close enough that three standard USB sticks next to one another barely fit—and watch out if a USB stick is slightly oversized. Why couldn’t Anker have used both sides of its USB-C hub for ports? The 6-inch USB-C cord is too short for a tablet with a USB-C connector mounted in its top half, from which this hub would dangle. There’s also no USB-C charging. 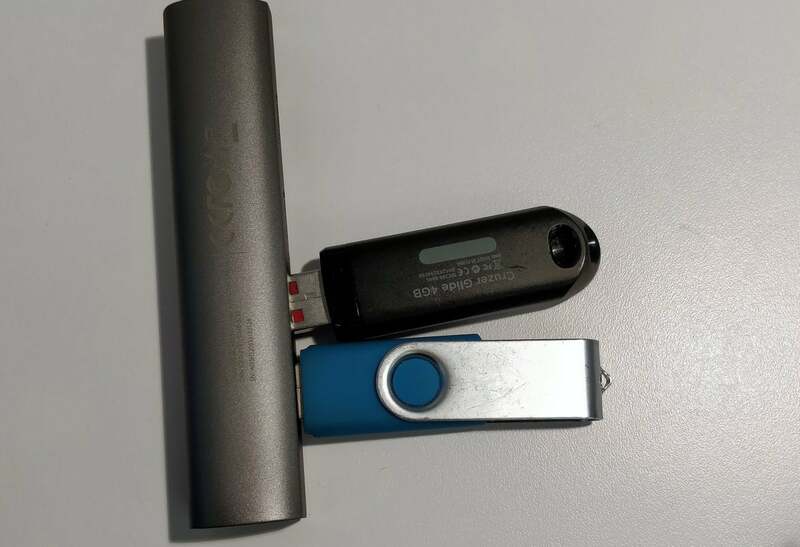 You shouldn’t have any concerns with overheating though—we copied files from two USB-connected drives while also downloading a file over ethernet, with no slowdown or noticeable heat. At press time though, the price was $60—too much, in our opinion. Lenovo’s GX90M61235 USB-C travel hub retains the same black, boxy aesthetic as generations of ThinkPad laptops. The odd pairing of connectors—VGA, HDMI (4K at 30Hz), a single USB 3.0 port, and Gigabit Ethernet—means you’ll be using your laptop’s keyboard, possibly a mouse, and either display connector. 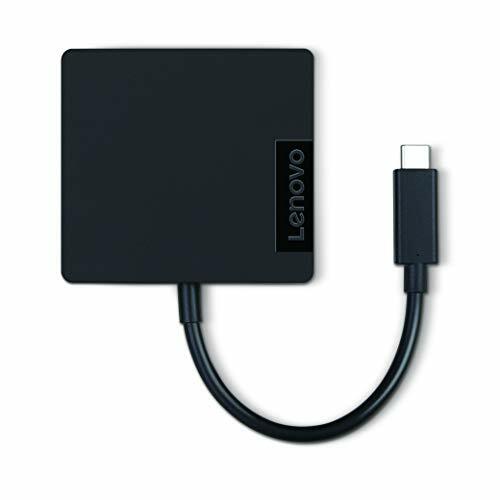 We’d rather see Lenovo pick either VGA or HDMI and add another USB port. To be fair though, all of the ports performed as expected and there was no perceptible heat increase when we tried to saturate the ethernet link and USB-C port simultaneously. We think that there are better deals elsewhere, in terms of price and ports. But if you need a VGA connector, this is one of the few options from which to choose. 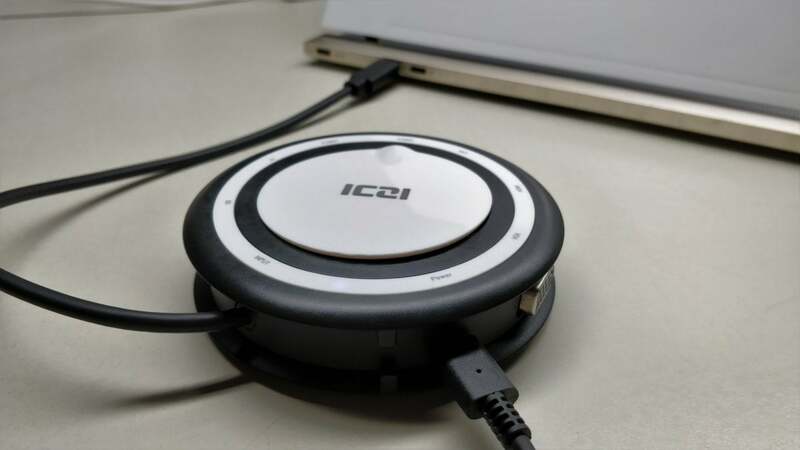 ICZI’s IZEC-TH01 breaks from the typical USB-C hub design, foregoing the “candy bar” form factor in favor of a radial hub. Two (not three) USB 3.0 Type A ports are seated next to SD and microSD card slots, HDMI (4K at 30Hz) and VGA, GIgabit ethernet, and a USB-C input connection for charging your laptop. The extra-long 11-inch cable wraps around the outside of the hub for storage. Sadly, the radial design means other cables (VGA, HDMI, etc.) will end up going in all directions. The center of the hub is taken up by a magnetic faceplate, large enough to store a dongle. Otherwise, our hub came with no documentation whatsoever, just a 24-month warranty card that’s double the duration of most of its competition. The IZEC-TH01 does get a bit warm under load (copying files from an SD card to a PC while also copying files from an external hard drive to an SSD, while streaming YouTube) but only to about 88 degrees F. It was a tad faster than other hubs, too. VGA and HDMI can be used simultaneously, and the hub supplies up to 900mA via USB-A for charging. 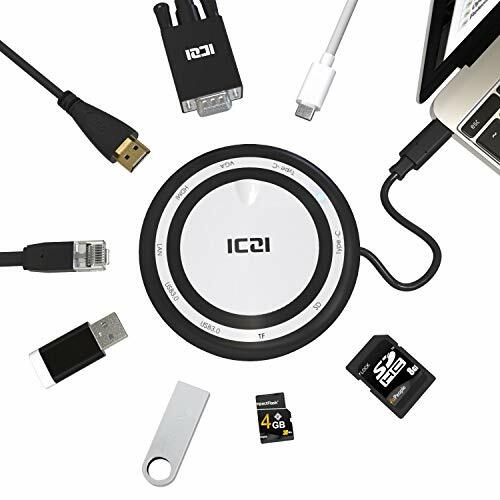 At 3.75 inches in diameter, IZEC-TH01 is a bit big and bulky for our tastes, especially with all the cables going every which way. Otherwise it’s a good value, and narrowly misses an Editor’s Choice award. This AmazonBasics USB-C hub is as simple as its name suggests: one extra-long (14 inches!) 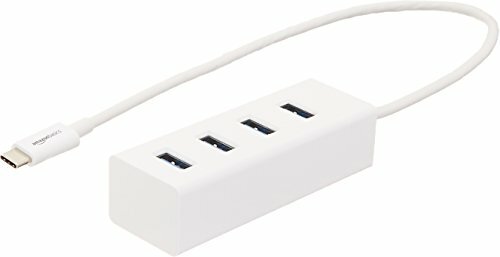 USB-C cable to your PC, connected to four USB 3.1 Type A ports for your legacy devices. Note that most hubs provide 5Gbps USB 3.0 ports, while this one provides 10Gbps USB 3.1 connections; you’d probably never notice the difference. We connected the hub to two bus-powered drives (one a 2.5-inch hard drive, and the other an SSD) plus a USB 3.0, bus-powered DVD-RW drive. We noticed a slight drop in performance while playing back a DVD and copying data between the two drives. But while one commenter on Amazon’s site noticed a power drop, we were able to burn a disc just fine with our drive—it seems enough power gets through the cable. The hub’s surface temperature didn’t rise more than a few degrees above the ambient temperature. This hub is cheap, basic, and delivers satisfactory performance for a great price. 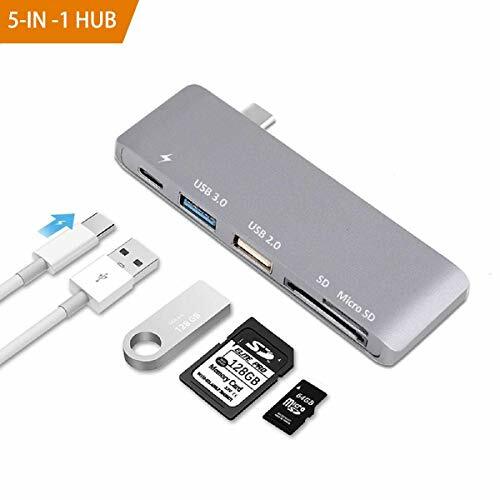 It lacks an SD slot or some of the other connections other hubs include, however, which are literally available for just a few dollars more. 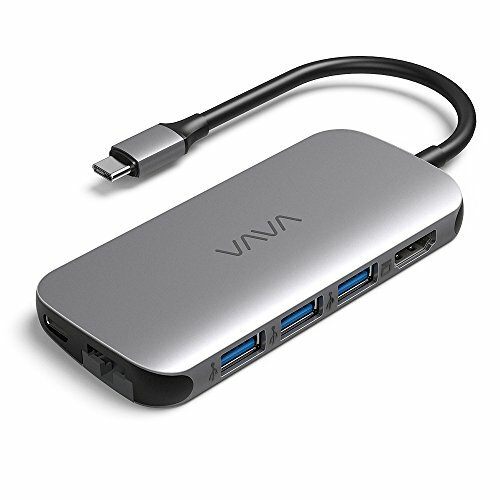 The Yuanj B0791BZBGQ USB-C hub is extremely compact—there’s no cord at all, which leaves the small metal hub (about 3.75 inches by 1.25 inches) fitting snugly against your laptop or tablet when plugged in. Be sure there’s room! All told, there are two USB Type A ports (but one is USB 2.0! ), microSD and SD slots, and a USB-C port that allows power into your laptop via a USB-C charging cable. The problem this design introduces is that inserting any USB cable or SD card probably means either picking up your entire tablet or laptop or removing the B0791BZBGQ entirely. Why? Inserting or removing devices while the hub is inserted tends to wiggle the entire hub, and who knows if that’s bending the USB port or connector itself. The real reason not to buy this, though, is the single USB 2.0 Type A port. A single 5GB file transfer from our SSD drive normally took about 18 seconds. WIth the B0791BZBGQ, it took 140 seconds, and other tests were equally bad. We recommend you pass on this one. While VAVA’s VA-UC006 packs a ton of functionality in a compact package, several design flaws mar what’s otherwise a solid product. This “kitchen sink” hub measures slightly less than 4 inches by 2 inches, and combines three USB Type A ports, microSD/SD slots, HDMI (4K at 30Hz), and Gigabit ethernet, plus a USB-C charging port for charging your laptop. It has a 6-inch cord. Unfortunately, the VA-UC006’s USB ports are spaced too closely together for even a slightly oversized USB key, like a SanDisk Cruzer Glide. The microSD card slot awkwardly forces you to lever the card in with a fingernail, to the point of it being flush with the hub. And because of its thinness, the ethernet port is expanded via a hinged piece, rather than being built into the hub itself. While that makes for a workable solution, it also has the potential to break. During use, the hub heated up to 99 degrees Fahrenheit under load—not uncomfortable, but among the warmest we tried. We really like VAVA’s goal of combining everything you want it in a small (4x1.88-inch) form factor, and we used the VA-UC006 to help set up our tests. But there are other, better alternatives.